If you enjoy playing Taboo, then Scott Singer’s Bleep Word Guessing Game is the app alternative to the game. Modeled after the popular board game, this app comes with over 2,000 guessing words with no repeats during the game, allowing you and your friends to play almost endlessly as you sit through a long car ride, wait in line for a concert, or just about whenever you and your friends find yourselves with tons of time to kill on your hands. 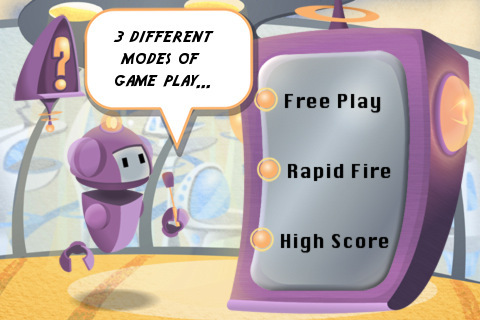 After you start up the game, you can choose from three options: Free Play, Rapid Fire or High Score. Free Play allows you to play for as long as you want. You can choose the time per round, allowing you to either play the traditional 60 seconds, 90 seconds, or 2 minutes for each round. Rapid Fire allows you to choose from three high scores (20, 30 or 40); you have 30 seconds to score as close to the high score as possible. The team who scores those points in as little time as possible wins. High Score allows you to set the timer and score you wish to play to. 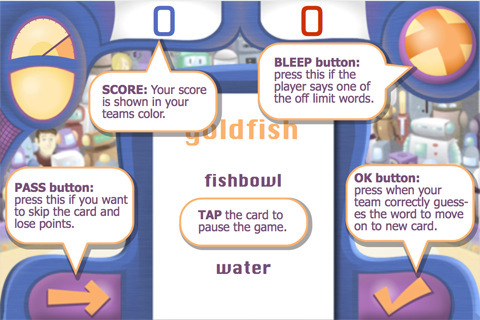 Bleep Word Guessing Game keeps score for both teams, freeing you from debating scored points or lost points after the game is over. A timer runs on the upper left hand side to ensure no one gets extra seconds of game play. Tap on the arrow on the left of the cards to pass on words or the check mark on the right when your team guesses the word correctly. Score double points on special words and be careful of Bleep Bombs that might pop up, requiring that your team guess a little faster before game over. There’s even a buzzer on the upper right hand corner for the opposing team to push down on when a forbidden word is said. Based on a futuristic game show theme that hearkens back to the 1970’s with crooked antennae and colorful light bulbs, the app also features a little purple robot as the host who acts as your guide through the game with both encouraging and snarky comments on your game play. The sound effects are minimal, with no music in the background as you play to minimize distractions as much as possible. Besides, what’s the point of having music when you’re going to be screaming at each other while trying to guess the word anyway? Bleep Word Guessing Game is a great game and I really enjoyed playing it. It’s nice being able to just pass around a device rather than a deck of cards when playing, especially when you’re in a place where a board game would not be the most practical thing to carry around. The only problem I had with the game was the buzzer. Although it makes sense to have a buzzer, it’s a little tricky buzzing a person when they’re clutching the device while trying to get their teammates to guess the right word. Otherwise, this game is very entertaining with tons of replay value. AppSafari review of Bleep Word Guessing Game was written by Julie Guan on March 19th, 2011 and categorized under App Store, Fun, Games, Strategy, Word Games. Page viewed 4478 times, 1 so far today. Need help on using these apps? Please read the Help Page.